Original paintings inspired by you. Enrich your experience of a memory. A wedding bouquet, a favourite view, beloved flowers, the things that make you smile. Crystalize your special moment. All art is personal. Even more so when a painting has been created especially for you. The process of commissioning a painting is a surprisingly straightforward one but with such magic results. My favoured subjects of the natural world; flowers and landscapes lend themselves perfectly to personalised paintings as so many people have fond memories of either a particular place or even a favourite flower. Working with your inspiration I create an original painting just for you or your (very lucky) loved one. How It Works – it’s simple! Have a look through my work and if there are any that you particularly love make a note of them. Email me with your brief. I’ve put an example of a recent commission below to give you an idea of what information is needed. This is the story of The Wedding Bouquet. Special Requests: Is it possible to create some prints from this I can give as gifts to my mother, mother in law and bridesmaids? Your original artwork is then carefully wrapped and delivered by courier to you. 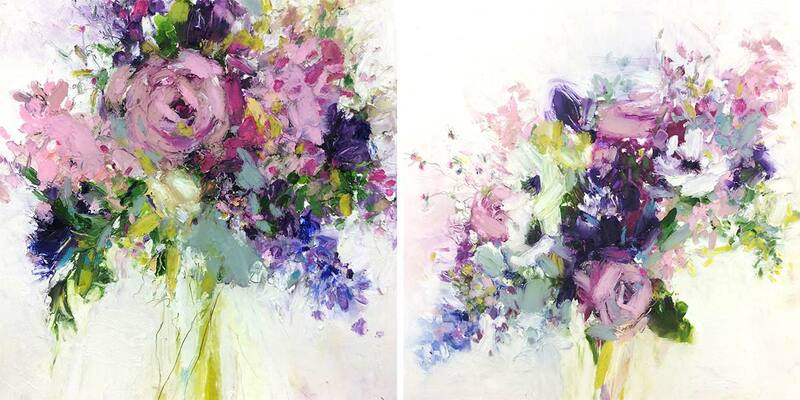 The example given above was of a real commission, the original painting was inspired by the bride’s stunning wedding bouquet. High quality signed prints were then created from the original which she gifted to her wedding party which I thought was a brilliant idea. I can turn paintings into silk scarves, notebooks, diaries so whatever your ideas let’s talk! It might even solve that anniversary gift conundrum! I hope that helps explain the process for you, I really love commission work so feel free to contact me whatever stage you’re at. There’s no pressure and I won’t pick up my paintbrush until you’re ready for me to start.